LOS ANGELES – A masked vigilante who some said has exceptional abilities escaped police custody yesterday after being accused of committing a robbery he claimed he stopped. An African-American male, identified as Dwight D. Jacobs, 38, engaged a robbery suspect in hand to hand combat on the 400 block of Bixel Street at approximately 9:53 p.m. on Wednesday after the robbery suspect refused to relinquish a grocery bag filled with cash stolen from a nearby liquor store, according to witnesses. The robbery suspect, also an African American male in his 30s, screamed ‘hysterically’ during his clash with Jacobs, flung the grocery bag into the air, and fled the scene on foot, according to witnesses. Jacobs — who wore a red emblazoned helmet, tights and cape — caught the bag and then two police squad cars arrived, according to witnesses. Police officers exiting their vehicles ordered Jacobs to place his hands above his head and surrender the bag, which he did, according to a police report. However, an altercation between Jacobs and police officers ensued shortly after because police did not believe Jacob’s alibi, and therefore they assumed he perpetrated the crime. As some police officers gathered testimony from witnesses, other police officers questioned Jacobs, who became increasingly argumentative as time passed and the robbery suspect continued to avoid capture, according to witnesses. More than two dozen bystanders gathered at the scene, according to the police report. They called for Jacobs’ release and chanted ‘let him go’ as officers struggled to control the crowd. “The people have spoken, and yet you refuse to listen!” said Jacobs, to which bystanders responded with cheers. Jacobs was arrested for disturbing the peace and brought to the Los Angeles police department’s downtown holding facility, where he was unmasked, fingerprinted and photographed. 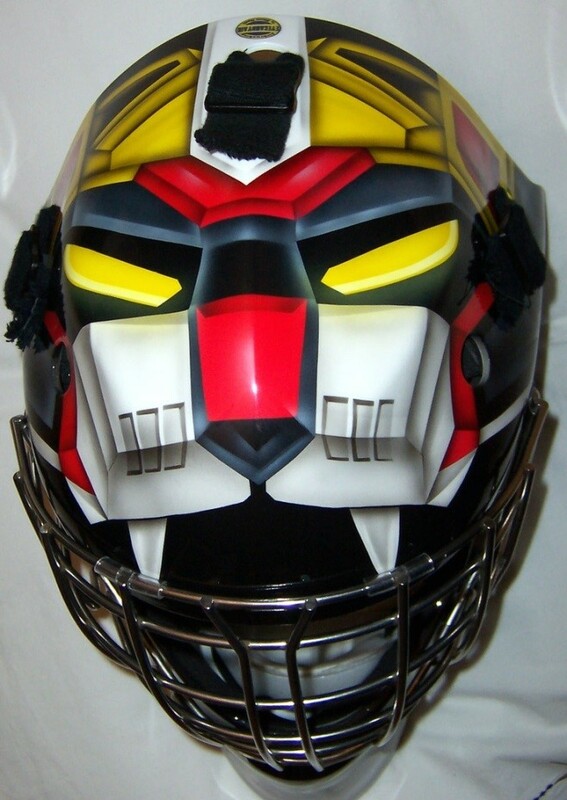 Dwight D. Jacobs, also known as ‘Night Watch,’ wore this Voltron goalie helmet confiscated during his arrest. Jacobs’ mugshot, however, mysteriously vanished from police files shortly after the vigilante’s escape from an L.A. jail. In Baltimore, an African-American ‘superhero’ residents called ‘Night Watch’ made headlines in recent weeks for delivering fugitives to law enforcement. According to statements provided in news reports, Night Watch used mental telepathy to ‘psychically manipulate’ his opponents. “Some like the head games Night Watch plays with criminals, others not so much, but love him or leave him, Night Watch always brings outlaws to justice,” said Tom Craven, a Baltimore resident. Until Wednesday’s incident in Los Angeles, however, the identity of the masked vigilante remained unknown. As Jacobs waited in jail, he revealed more information about himself to his cell mate, Jeremy Reeves, a Caucasian male, 42, taken into police custody for public intoxication. Reeves said Jacobs whistled at a guard, who then approached Jacobs. Jacobs stared at the guard, who then grinned dreamily at Jacobs and opened the jail cell. “How’d you do that?” said Reeves. Jacobs walked away, according to Reeves. According to the police report, Jacobs changed his identity after his jailbreak, and he remains at large.